Omaha, United States -- United States' Team John Shuster (Photo: Anil Mungal) repeated their Olympic victory over world champions, Sweden's Team Niklas Edin, to win the Curling World Cup leg two at Omaha's Ralston Arena 3-1. Shuster's rink, cheered on by a patriotic Nebraskan crowd, ran Sweden out of stones in a tight, tactical 3-1 victory. In doing so, they booked their tickets for May's Curling World Cup Grand Final in Beijing and banked a winners' cheque of $USD 20,000 (and $USD 7,500 from round-robin wins). A crucial moment of a low-scoring encounter came at the end of the seventh end. With United States lying two, Sweden skip Edin decided to take out one of the shot stones to keep the hammer for the final end. That meant they were 3-1 down, instead of 2-2, and it was a risk that ultimately didn't pay off. In the final end, Sweden were run out of stones. Edin produced a soft-weight take-out but Shuster blasted it away, leaving three American shot stones and only one Swedish stone left to throw. The world champion from Ornskoldsvik offered his hand. "What a great tournament," said Minnesota native Shuster. 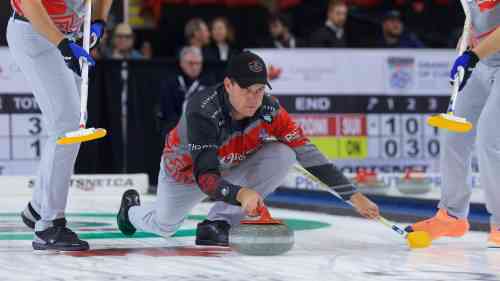 "There was some great curling out here and some really great teams. I'm really proud to get a win any time you have your country on your back. "It was a lot of fun [to play in front of home crowd] - they were into it. For me, it's always been easier every time we have lots of fans in the stands and we definitely got that feeling here this week, especially this afternoon." The final was largely a cagey yet intriguing game with only a single point scored in the opening four ends - a steal by Team Shuster in the second end. Even when Edin did put a point on the board it was with a reluctant draw to surrender the hammer in the fifth, and Shuster was forced to do the same in the sixth for a 2-1 lead. Then came Edin's bold, but fateful, decision to surrender a point in the seventh. On that big call, Edin said: "If you take one there, you're toast, you've got five per cent chance to win the game. It's a difficult call to give up one there, but it's a bad situation and I obviously had no choice." On the match overall, he offered: "It wasn't a very well played game, we couldn't figure out the ice. Both teams missed both high and low side. "When they stole one we knew we had to keep the hammer; with the five-rock rule you need the hammer. They didn't take too many chances and we didn't want to take any risks either in not getting that deuce back. We took too long before we started playing well enough to give ourselves a chance. "It's always nice to play a good team, especially with their home-crowd too, you get some more spectators coming. I'm a little annoyed we couldn't play better in this game and give it a better chance." Team Edin now have only a few weeks before the next Curling World Cup event in their own country. Jonkoping hosts the third leg, starting from 30 January. "We're looking forward to being on the home field and curling rink where the ice will probably be a bit more consistent," said the 33-year-old. "I'm looking forward to a really good event there and I think it's going to be the best Curling World Cup so far." The live blog and live scores from Omaha 2018 can be found on www.curlingworldcup.com. You can also follow all the action on Twitter and Instagram (@CurlingWorldCup) and using the #CurlingWorldCup hashtag. For the Grand Final the host country, the three winners from the first three legs, the current world champions and a 'special invite' team - such as the reigning Olympic champions - will all earn places. The Curling World Cup ranking list, in each discipline, is a cumulation of Curling World Cup points earned by the competing Member Associations at each leg of the series. Teams are handed three points for a win in eight ends and two points if they win after a shoot-out. The team that loses the shoot-out gets a single point and a losing team after eight ends gets no points. In addition, the winning team, in each discipline, will get ten points and the runner-up five points.